You are here: Home » MEDIA » Books » Believing: The Neuroscience Of Fantasies, Fears And Convictions by Michael McGuire (book review). 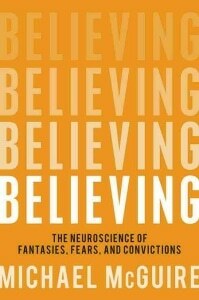 Believing: The Neuroscience Of Fantasies, Fears And Convictions by Michael McGuire (book review). In many respects, Michael McGuire’s book, ‘Believing: The Neuroscience Of Fantasies, Fears And Convictions’, is more a road trip through his life and he picks out his experiences and people he’s met as he looks into the power of belief. Although he touches on religion occasionally, this is only a small part of the entire subject as he is more concerned with why we believe in anything and how so many people believe something without any facts to back it up. Think that doesn’t apply to you? Are you afraid to walk under ladders or avoiding walking in front of a black cat or any other superstition? Then you’re clearly putting belief before fact. Well, nearly. With ladders, it depends if someone is up it with a bucket of paint and whether my walking under it would cause any harm so I can see how that one would have evolved. I do see what he means, though. The matter of belief seems to be a sentient thing as none of the animal kingdom shows such beliefs. If anything, Man tends to rely too much on belief in his prejudices than anything brought by knowledge. The fact that it has a resurgence right now is either Man is acting like a herd animal or there is something wrong with the educational systems throughout the world. Then again, when you compare the Bible interpretation of how life was created to what really happened, I would definitely say that, in its collective head, Man is regressing than taking on what science has discovered. McGuire goes even further and points out that even disbelief is a form of belief, mostly because even when evidence is presented, a lot of people will ignore it. Look at the current reaction to global warming. It becomes even more dangerous when it is the people in power or in charge of other people who have these beliefs. Look at how the act of one man, President George W. Bush, curtailed developments in stem cell research which would surely have been saving people by now. The figures on page 52 showing the belief in creationalism around the world is still pretty damning. I’ve talked a lot about this subject in other reviews and it’s still worrying how many people can’t contemplate evolution despite all the evidence for it. Belief affects everyone, including McGuire, who discloses an encounter with a jaguar while in a jungle in Guatemala and thought because it was a member of the cat family that it wouldn’t be able to swim and tried escaping by getting in the river. I thought everyone knew they could swim. In fact, most of the big cats can. I would have thought it would have been mandatory logic that if you’re going to a foreign country, that it would make sense to read up on any potential dangers and carry the right precautions and knowing what to do in such situations. It’s a good thing there were no crocodiles nearby. McGuire explores how we look at things intuitively and making sense of patterns but it does get distorted if you don’t have the right knowledge to make the right choices rather than be self-deceived. In many respects, I wish McGuire had moved away from anecdotal analysis and a bit more on the nature of belief. Having said that, as my reaction above has been analytical, maybe he wrote the book this way to ensure such thoughts come out in the reader. As such, he’s succeeded. Although there are a lot of things we have to believe in, like atoms because we don’t normally see them, there is a lot about this world that we do take on trust and a lot of that comes from that we give to other people. Although I wouldn’t advocate distrust in other people, I do think it would make sense to think about and question anything that relies too much trust without evidence. As religion is the strongest area of belief, for those more religiously inclined, there is nothing wrong with believing in a deity but that and religion are two different things and the latter clearly doesn’t need to be believed verbatim. If that belief changed then perhaps the rest will follow. Maybe I’m too firm a non-believer or I question too much. « The House In Nightmare Park (1973) (DVD review).